Aircrews and Soldiers from 1st Combat Aviation Brigade, 1st Infantry Division and 4th Stryker Brigade Combat Team, 2nd Infantry Division conduct a "Raider Stryke" air assault raid against a time-sensitive target in the Diyala River Valley (DRV) of Iraq during OPERATION IRAQI FREEDOM 07-09. Following the surge of forces into Baghdad in May 2007, many enemy, insurgent, and foreign fighter networks moved north into the DRV to find sanctuary. US and Coalition Forces, using advanced intelligence capabilities to target these cells, and the Raider Stryke team of air and ground forces, conducted numerous hasty air assault raids to precision targets with tremendous results. The Raider Stryke team brought a swift, agile, and lethal capability to the fight, allowing Commander�s to bypass the restrictions of road networks and hazardous terrain. Targets that were previously unreachable within fleeting windows of opportunity were now under assault. 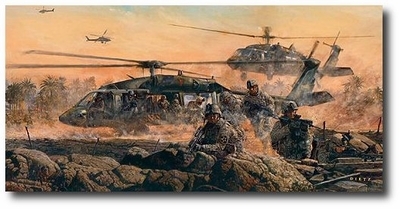 Through nightly raids over the course of several months, the Raider Stryke team methodically dismantled the enemy networks from Baghdad and Tarmiyah to Balad, and from Baqubah to Muqdadiyah. The results were astounding in the number of high level enemy captured and killed, weapons caches and explosive devices uncovered, prisoners rescued, and enemy sanctuaries denied. 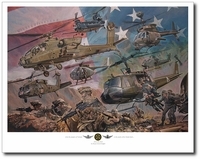 Never before had the enemy witnessed such a formidable combination of intelligence, ground forces and combat aviation assets. Never before had the enemy been subject to such relentless pursuit � there was nowhere to hide! No Mission to Difficult, No Sacrifice Too Great, Duty First!